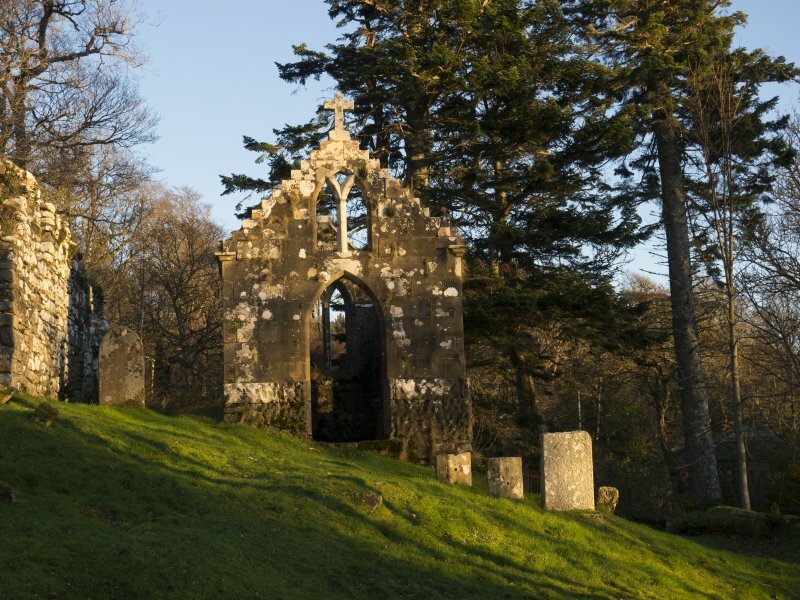 St Maol-luag's Chapel, Raasay. 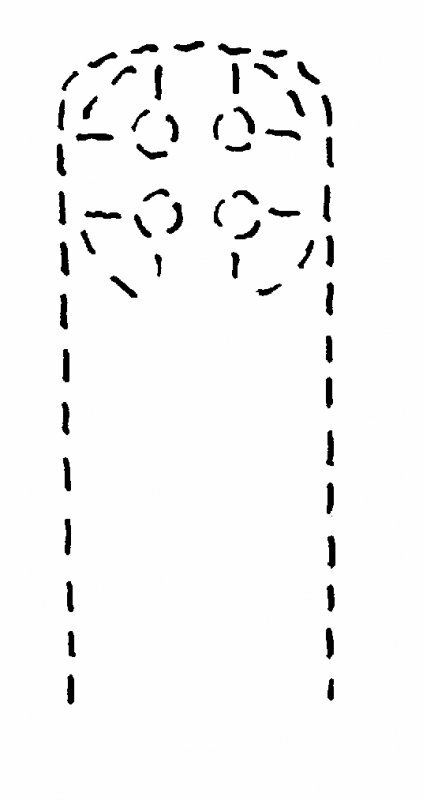 Cross-slab. Drawing based upon description in Outer Isles Inventory, no. 573. 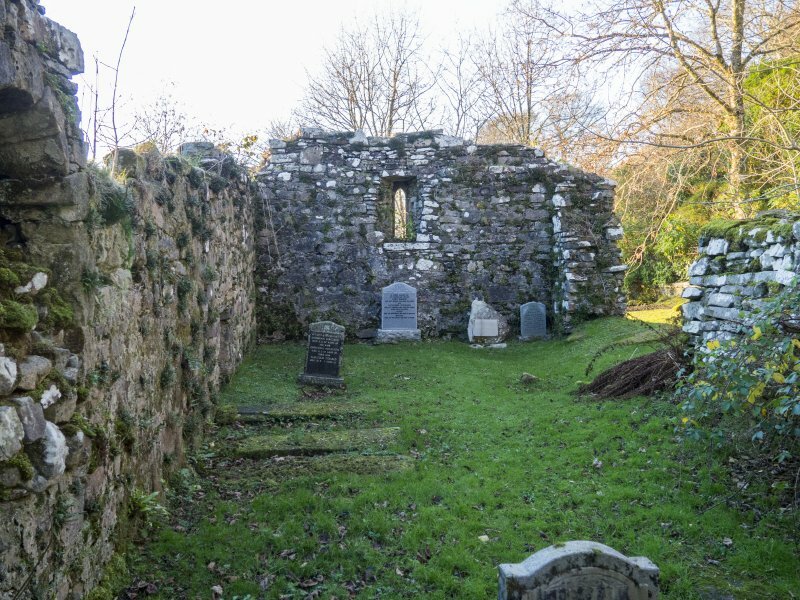 Kilmoluag graveyard A walled enclosure with three roofless structures and a number of grave slabs, one with fragments of medieval sculpture. 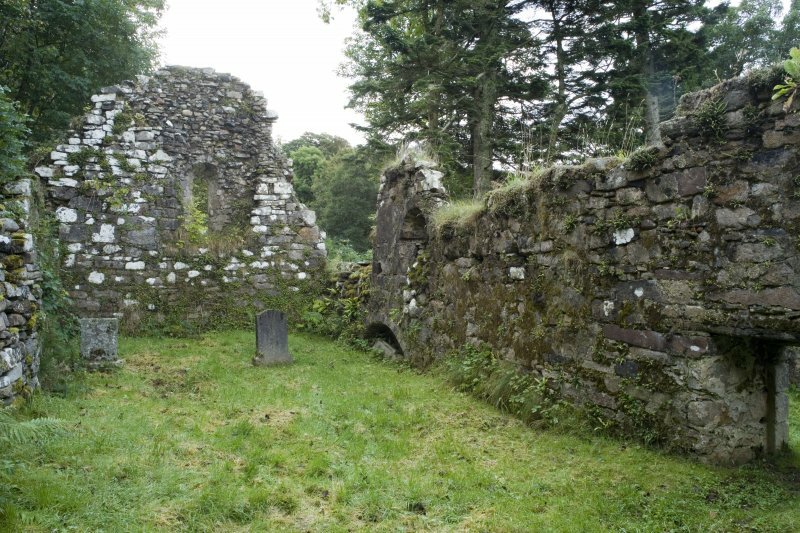 Former parish church, early 13 th century, the rubbly ruin of a medieval church on a religious site founded c.560-90 and dedicated to St. Moluag. 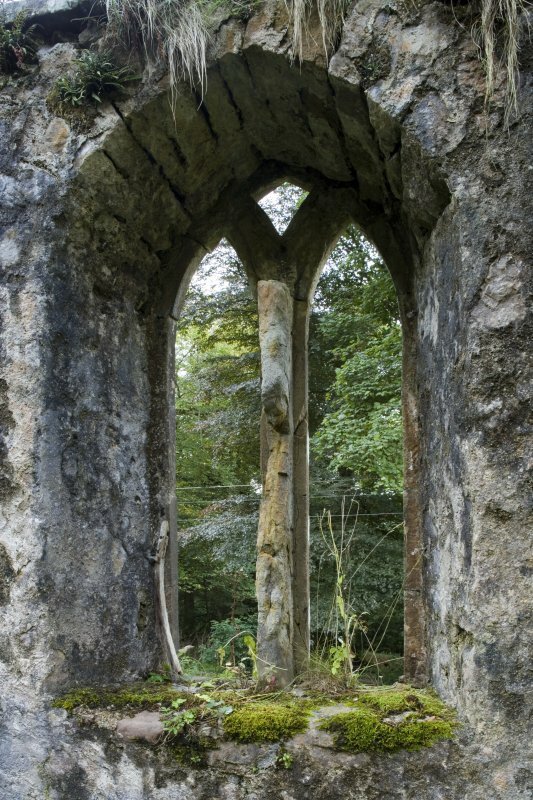 It has a good round-arched splayed window in the east gable and a late medieval arched tomb recess on the inside south wall. 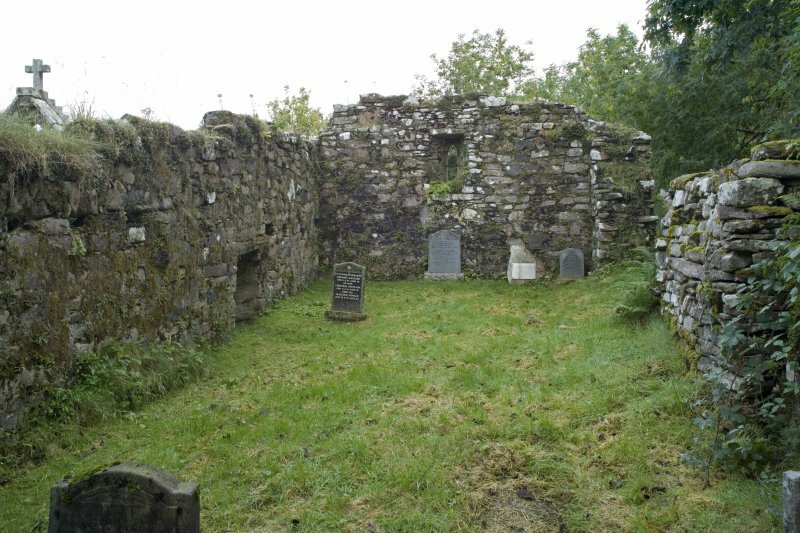 By 1773, when Raasay was part of Skye's Snizort parish, it was 'unroofed and ruinous' and used for burials. Memorial chapel, 1839, in memory of a Macleod daughter, possibly replacing the 'family burying-place' visited by Johnson and Boswell in 1773. This ashlar-faced Gothick chapel stands on a sloping site, underbuilt by five courses of rock-faced masonry, in the fashion of Edinburgh's New Town. Just visible is a tiny, lichen-blurred female mask reset on the inside apex of the east gable. Boswell saw it on the earlier building - a 'small bust or image of the Virgin Mary, carved upon a stone which makes part of the wall'. 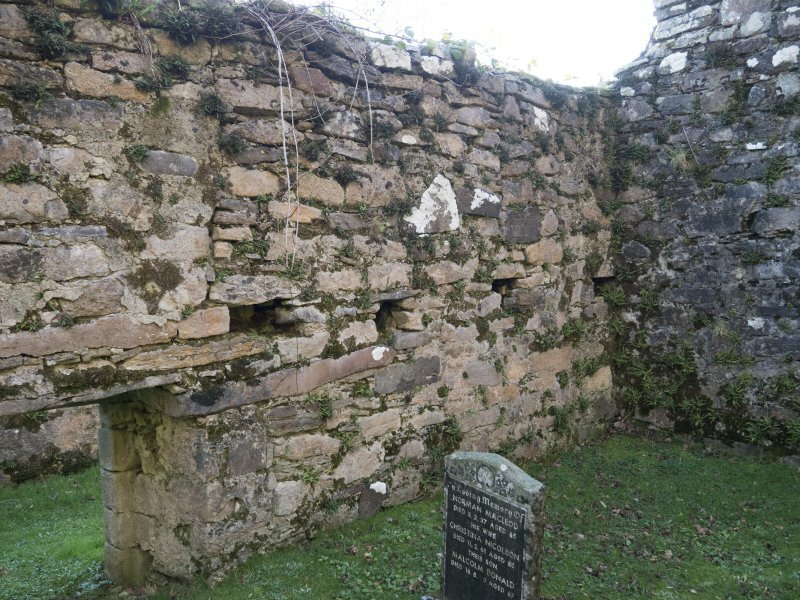 Burial lair to west, possibly 11 th century, with bevelled door lintel. 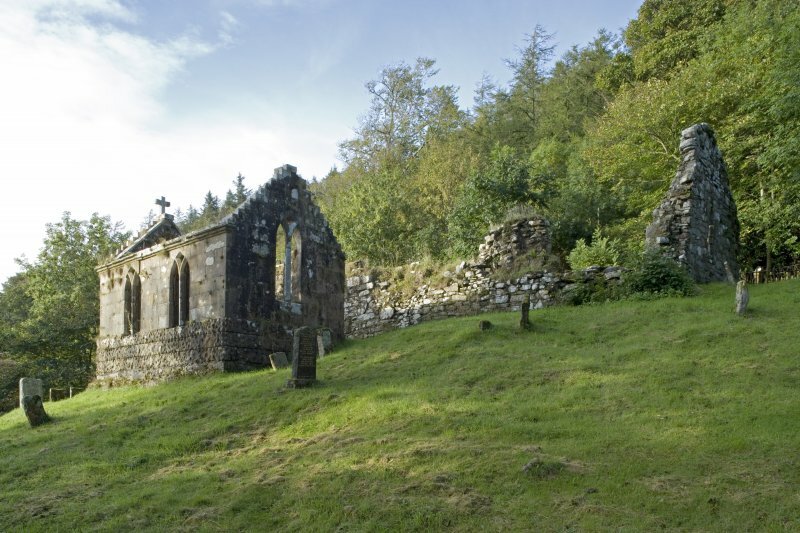 St. Maol-luag's Chapel as described above. 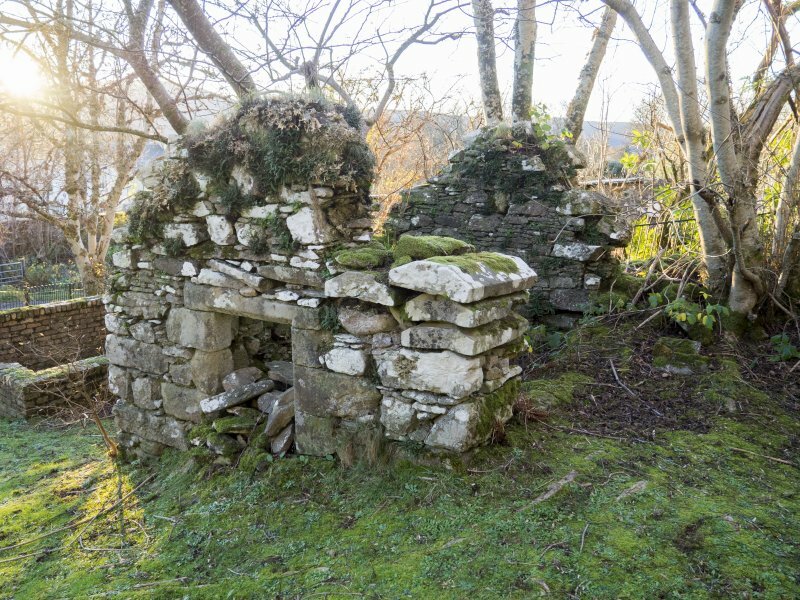 On the S side of the chapel is a small detached 19th century family burial vault of the Macleods of Raasay. 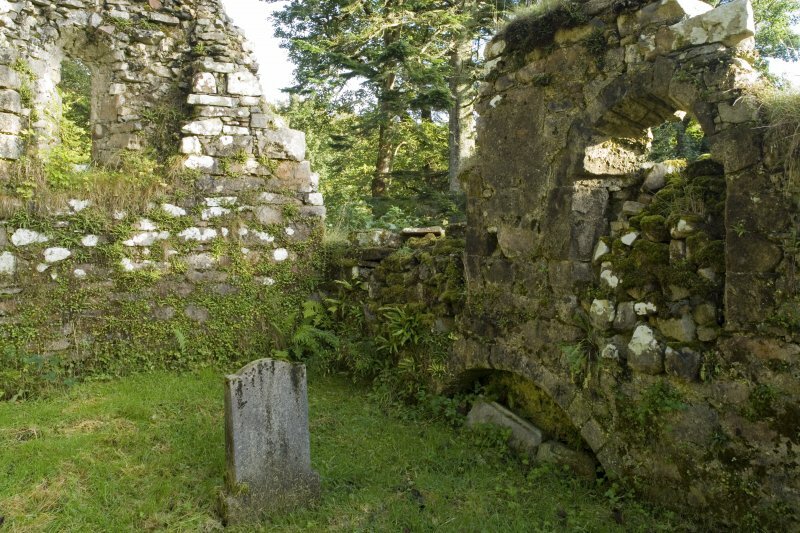 The burial ground is still used for the descendants of those interred there. Visited by OS (A S P) 12 June 1961. The decorated cross-slab mentioned by RCAHMS could not be found, otherwise no change. Visited by OS (R L) 22 September 1971. A survey of the graveyard of this site was carried out by The Association of Certificated Field Archaeologists (ACFA) in 2005. 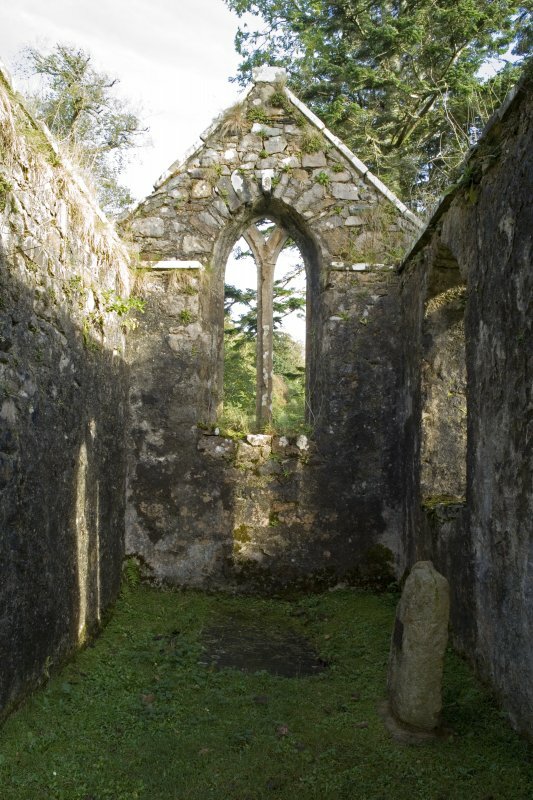 A total of 91 stones were recorded and measured, including those of the MacLeod family, which were contained within a small mausoleum to the S of the chapel remains. 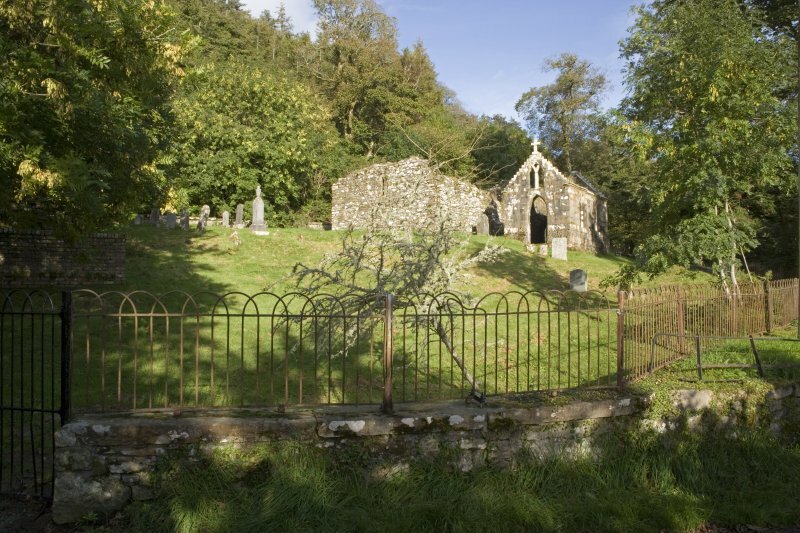 The graveyard measures 46m x 29m and is bounded by a stone wall surmounted by an iron railing. Within are three ruinous structures, all aligned E-W. The largest is the chapel, which is 16m x 7.5m. 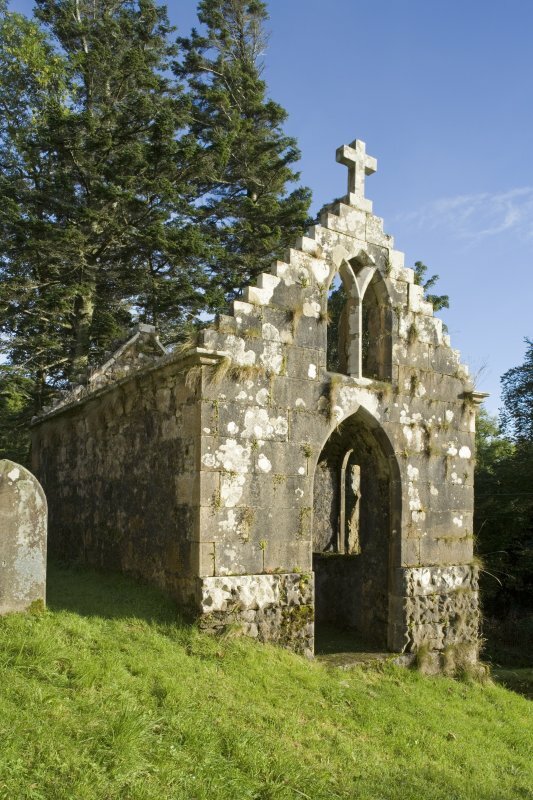 The early Victorian MacLeod Chapel or mausoleum is 6.5m x 3.5m. Finally, there is the small mausoleum known as the Lady Chapel, which is 4m x 3m. In addition there are 5 other enclosures in the graveyard that contain memorial stones. 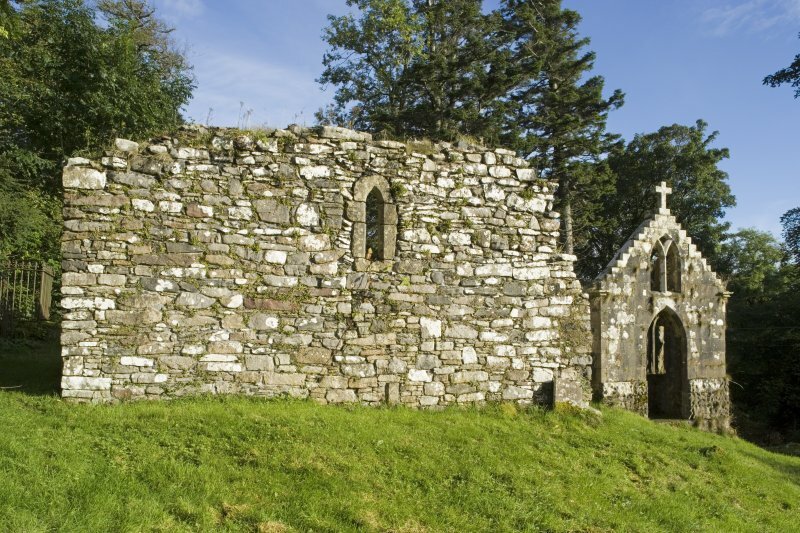 The chapel is dedicated to St Moluag, a missionary saint from Bangor, Ulster. 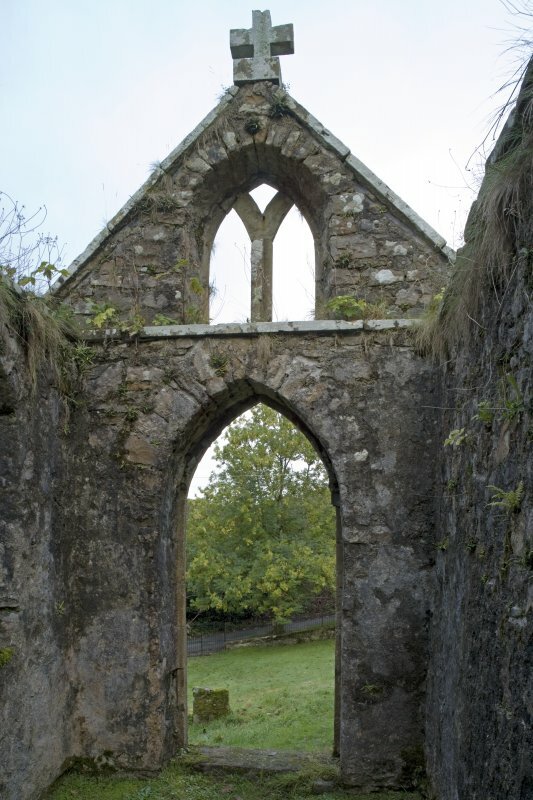 The chapel is mentioned in 1501 but is clearly older than this. 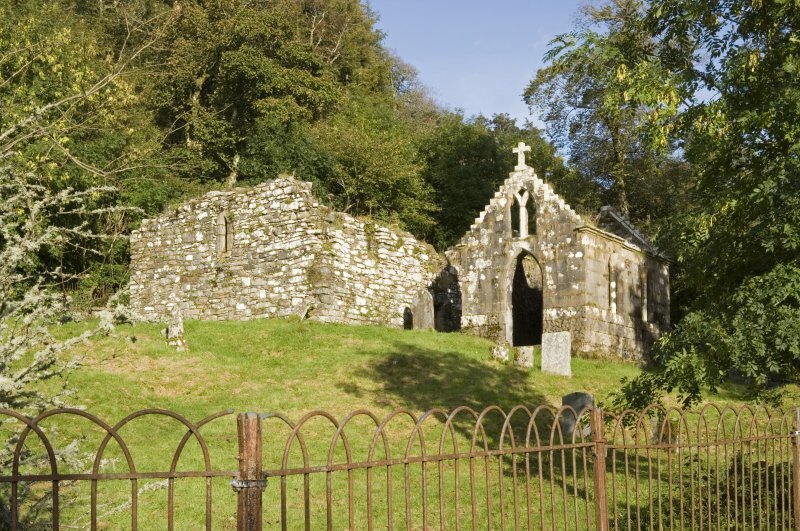 It is believed that the settlement was founded by monks from Lismore or direct from Bangor in AD 569. Although the surrounding graveyard is quite small, local tradition believes it has been more extensive in the past. 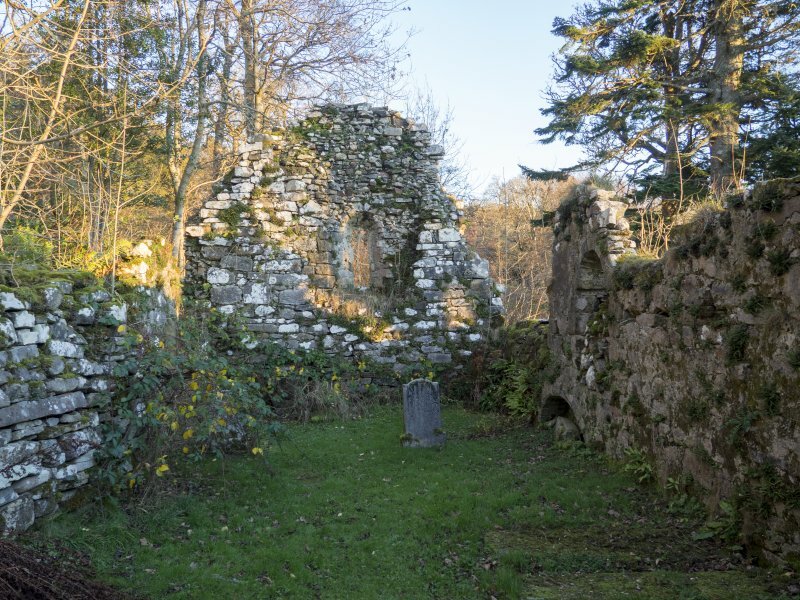 As part of ACFA's continuing survey of the Isle of Raasay the remains of the 13th-century chapel were surveyed and recorded. 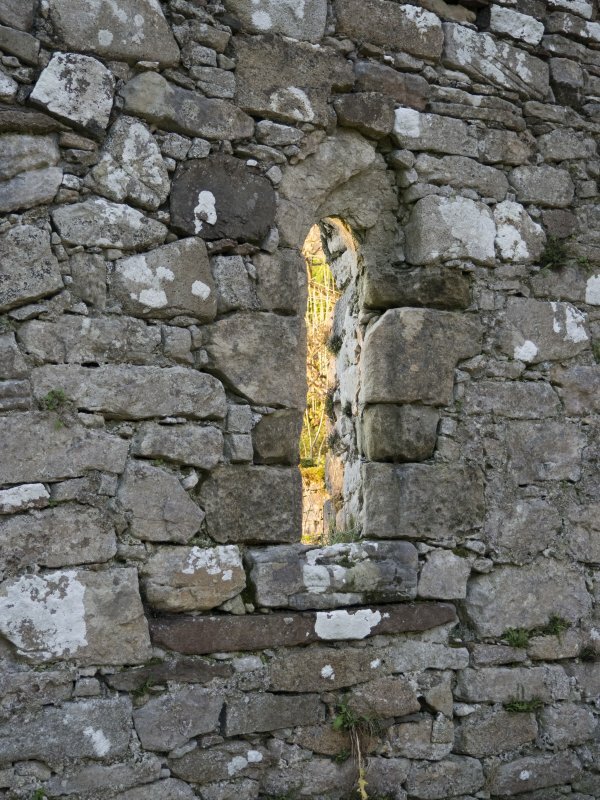 The different style and construction of the window opening on the W wall from those at the E of the building were noted and it is suggested that the W end is a second, later stage of development and that the orignal eastern part could be of an arlier date than previously thought. 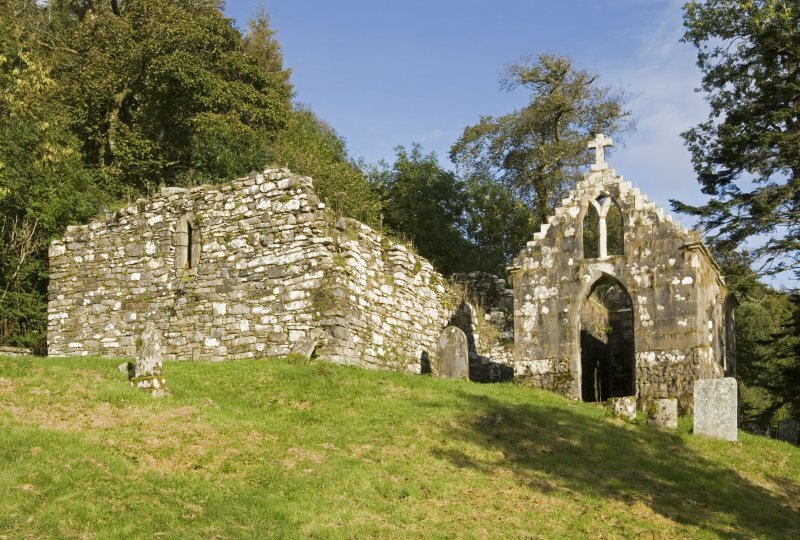 An inventory was made of the stones and the markers surrounding the chapel and the other structures in the graveyards were recorded. 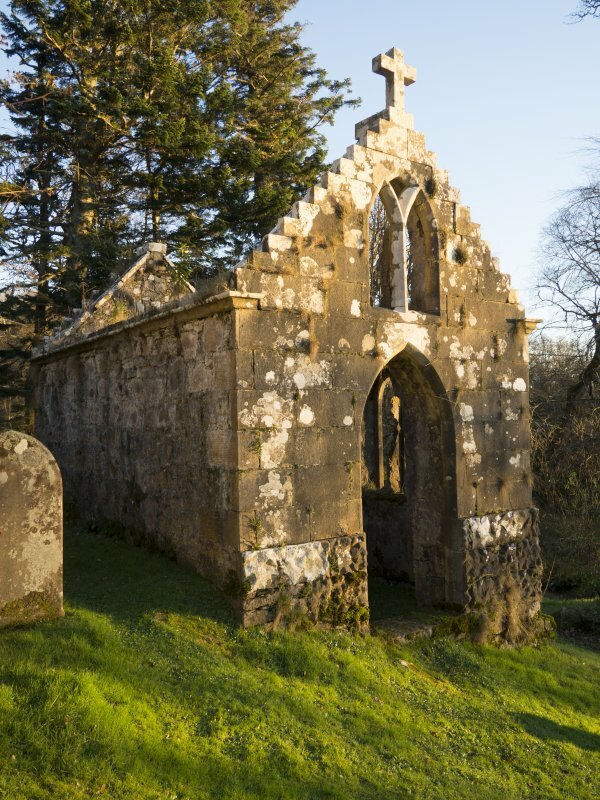 The Lady Chapel (Macleod Mausoleum) adjacent to the S wall of the chapel, previously thought to date from 1839, was found to have been described by James Boswell in 1773 during his visit to Raasay with Dr Johnson. Reports lodged with drawings and photographs have been lodged with NMRS and Highland Council. NG 5483 3663. 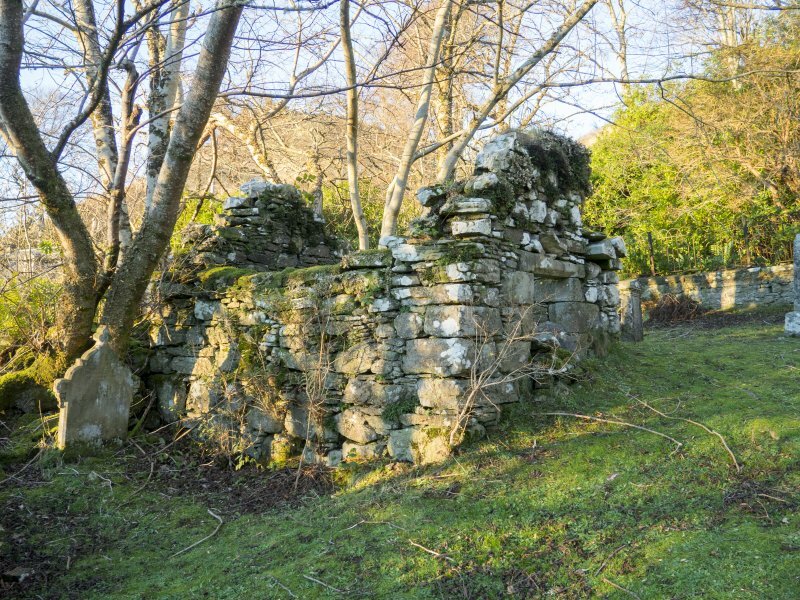 St. Maol-luang's Chapel (NR) (In ruins). 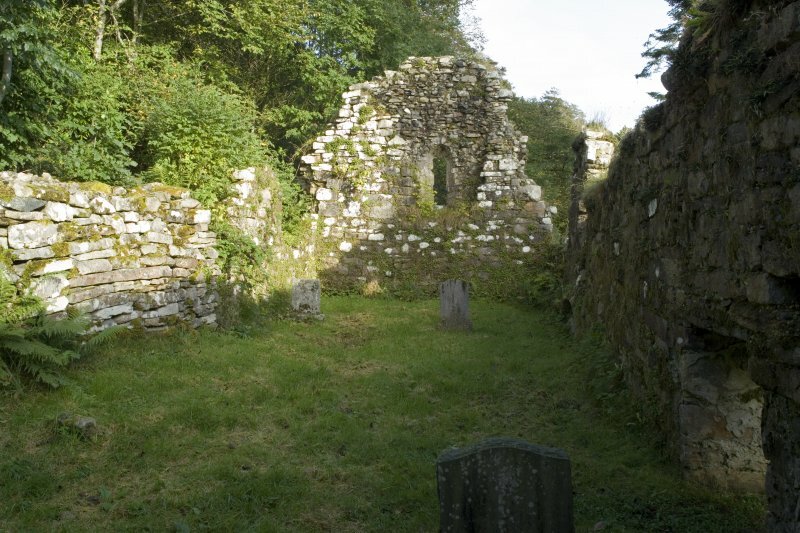 St. Maol-luag's Chapel, Raasay, a church dependent on Lismore in Loan, the central community of St. Moluag, (A B Scott 1918) is described by Johnson as a chapel unroofed and ruinous. Its precincts were of old a sanctuary, which was marked by 8 erect stones or crosses mentioned by Martin as pyramids for deceased ladies, (NG53NW 4) some of which were remaining in 1773 (OPS 1854; M Martin 1934). 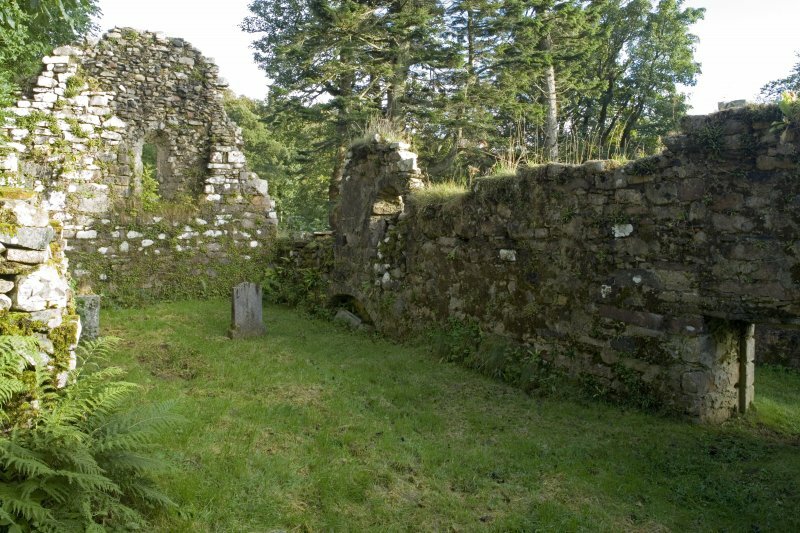 The ruins of the 13th century chapel (D MacGibbon and T Ross 1896-7) are situated within a small burial ground. Both gables and the larger portion of the S wall remain to their original height, but the N wall is now considerably broken down. There are a number of interesting features, details of which are obscured by obvious changes of ground level both internally and externally. 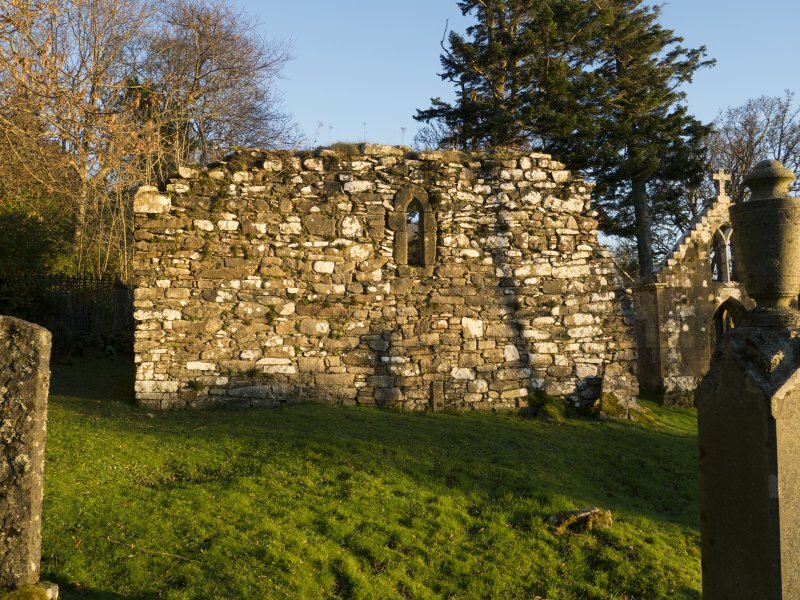 The chapel is roofless, orientated NW-SE, and measures externally 52ft long, 24 1/2ft wide at the NW gable and 2ft at the SE gable. 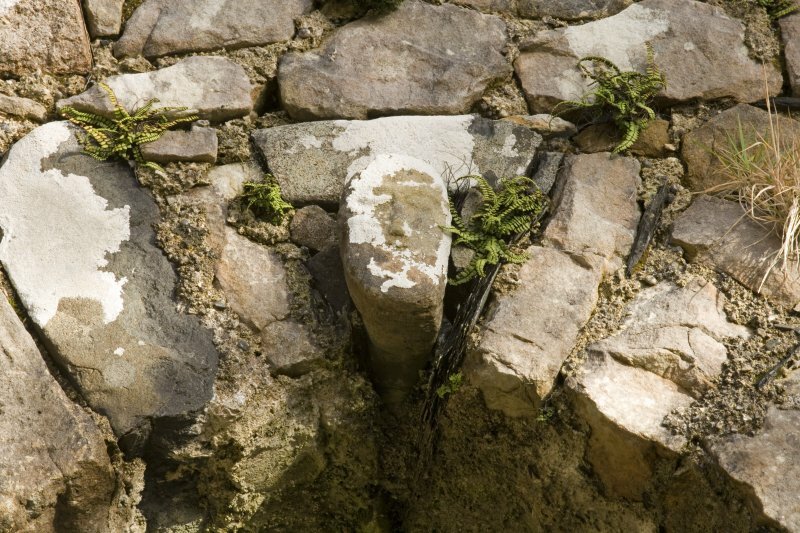 The walls are 3ft thick and there is evidence, especially in the S wall, of structual alterations at different periods. 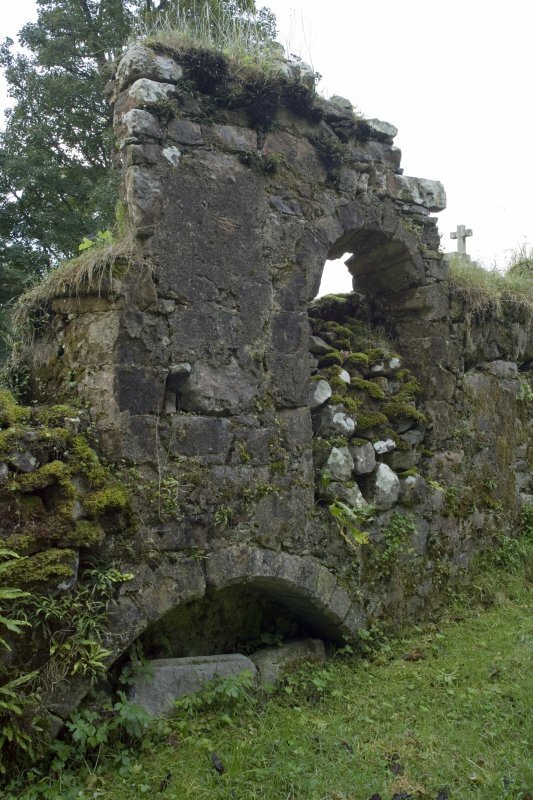 The original door was placed 16 1/2ft from the W end of the S wall, but it appears to have been built up and substituted by another doorway, traces of which can still be detected in the dilapidated N wall. 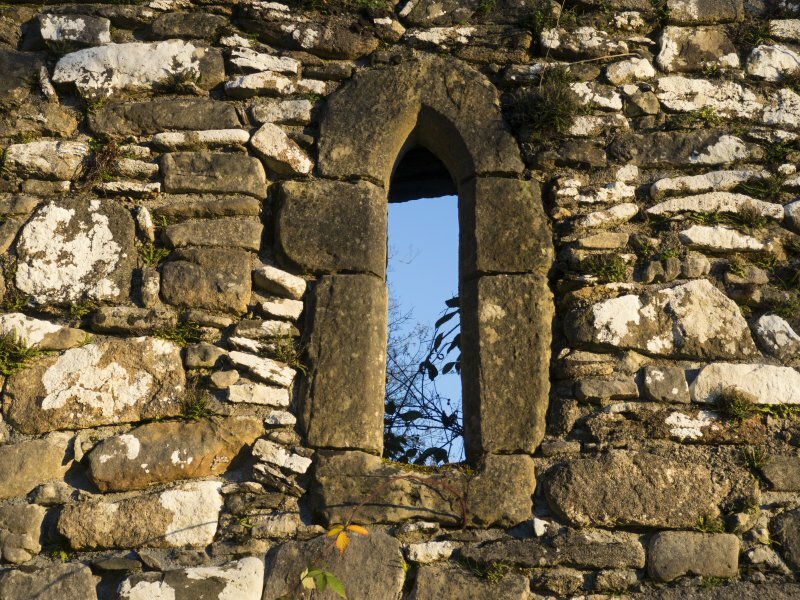 There are windows in the E end of the W wall and N Wall, and the W gable. 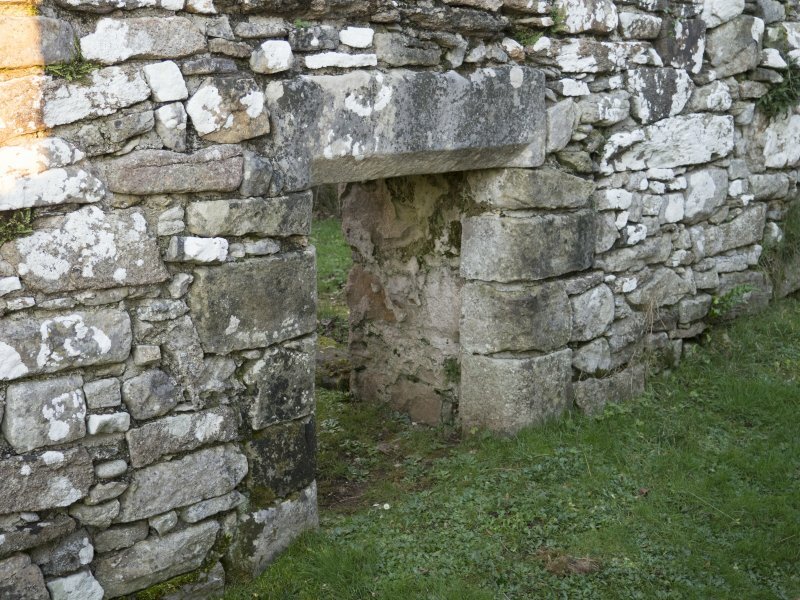 The W gable is intaken 10ins - 1ft at 10 1/2ft above the present interior level, and remaining joist-holes indicate that there was a gallery at this end. Similar joist-holes in the N and S walls near the E gable possibly indicate provision for a screen. There is a tomb recess in the S wall. There is a decorated cross-slab in the burial ground. (W D Simpson 1935). D MacGibbon and T Ross 1896-7; Orig Paroch Scot 1854; A B Scott 1918; RCAHMS 1928; M Martin 1934; W D Simpson 1935.